SPOILERS AHEAD – Don’t read if you’re not all the way caught up on Game of Thrones…. And if you’re not, why not?? This morning it occurred to me that I hadn’t really thought through what’s about to hit Winterfell. The Night King is on the march towards the wall, or at least towards Eastgate, and possibly around The Wall. He’s got a shiny new dead dragon to probably blow a hole through that Wall. That’s the immediate future. What’s after that? Winterfell. Littlefinger will stage a coup to take over Winterfell. He has the troops on his side, and thinks that Arya is going to do his dirty work for him and get rid of Sansa. If that was going to happen, she probably would have done it last week while she had that knife in her hand. (That knife is the one the assassin tried to kill Bran with, and was stolen by Littlefinger after Ned Stark’s death. It was on Ned’s desk in King’s landing). So, I don’t think Arya’s going to do Littlefinger’s dirty work for him, because chances are pretty good she’s on to him. Arya could outright kill Littlefinger. I think there’s an additional possibility that would be a lot more interesting. 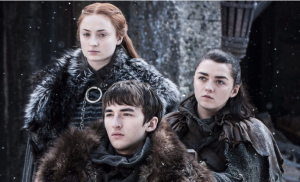 In the midst of plotting how to take care of Littlefinger, Bran intervenes and tells Arya and Sansa they have to get the heck out of Winterfell. Sansa will probably resist, thinking that she’s got to stay at Winterfell to hold the family home. Arya would tell her that Littlefinger has been plotting, and they need to run for their lives. On the face of things, it’ll seem that is what Bran is warning about. Cut to Sansa, Arya and Bran getting the heck out of Winterfell. Littlefinger enjoys his victory at taking over Winterfell – and then the thing that Bran was really worried about happens – The Night King and the Dead arrive, and swarm the castle. Bet Littlefinger hasn’t thought through all the possibilities and has come up with that scenario. A much worse scenario would be for Sansa to be stuck there only to die when the dead take over. Since Bran presumably has to survive through all this, it could just be that Arya and Bran end up leaving. Or they could all end up hiding in the family catacombs. Wouldn’t be very good to be hiding out down there, with the Night King wandering through bringing back their dead relatives though. 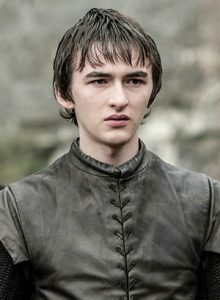 I rewatched season 6 of Game of Thrones in preparation for the season 7 premiere tonight, and it just occurred to me The Wall has a big problem: Bran Stark. As Benjen was leaving, he explained to that since he was partially dead, he couldn’t travel with Bran to go past The Wall. There are all kinds of enchantments built into the foundation of The Wall itself which makes it impossible for the Night King and his army to pass. These are the same enchantments that prevent Benjen from going past the wall. The Three-Eyed Raven was surrounded by similar enchantments, but was able to break through those because Bran had been “marked” when he was on a vision quest. Remember that burn on Bran’s arm when the Night King grabbed him? This is probably blatantly obvious to some of you since last season, but I think that as soon as Bran gets past The Wall, it’ll give The Night King a free pass to go right through. There will be a big fight, sure, but the Night King and his army will make it through – all because of Bran.